What made large scale resistance possible at the G20 in Hamburg? 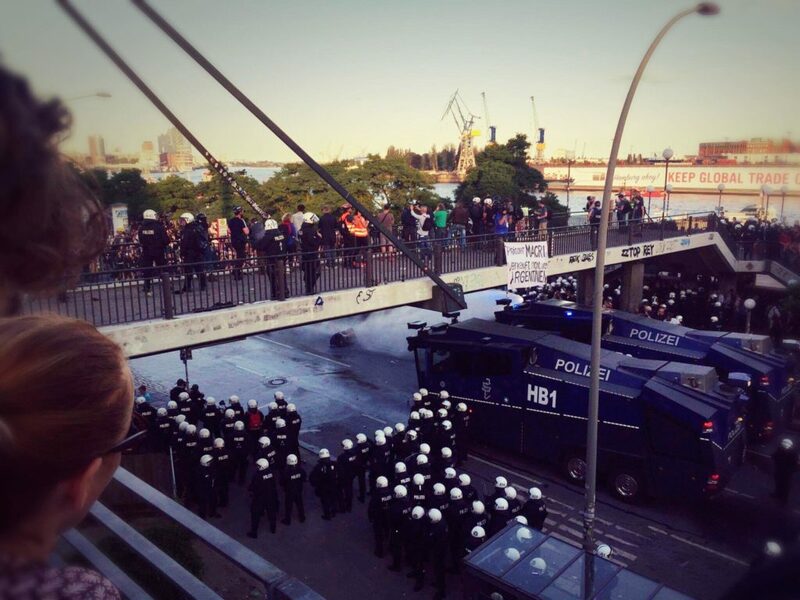 An on-the-ground account from the G20 protests in Hamburg, Germany originally posted by Black Rose Anarchist Federation. Similar to the impact of the 1999 WTO protests in Seattle, we may look back at the Hamburg G20 protests as a symbol of global discontent that ruling elites were not able to ignore or dismiss. Beyond the tear gas and street fights, we raise the question: What made this display of dissent possible? The police lost in Hamburg at G20. Twice. Their tactics of immediately attempting to breakup mass demonstrations, forcing people over walls as they beat stragglers with clubs, the constant use of pepper spray laced water cannons, and riot squads served only to decentralize the revolt and incur greater resistance. They made it necessary to set up barricades and defend them with rocks and bottles for basic self-defense. This is something that all the discussions of violence at the conference in the mainstream media seem to ignore. The police attacked first, with no discretion and extreme force. The police had very little interest in making arrests and only arrested 186 people (which, considering the scale of the protests and action, is very few); they were far more interested in beating people to a pulp. I personally saw people tackled, beaten by several officers, and then left bleeding in the street. From the stories of others this, as well as other random acts of violence, seems to have been a very common practice. The result was decentralized action aimed mostly at luxury cars and big business. After the several thousand strong black bloc on was broken up on Thursday, clashes broke out across the city lasting until well into Friday morning. Protesters were able to enter the massively militarized “Red Zone” on Friday, utilizing a many-pronged approach focusing on different entrances. Parts of the harbor (the prime industrial driver of the city and a route of travel for some delegations) were shut down along with many streets, even blocking officials from attending their meetings. A temporary autonomous zone was created in the Sternschanze neighborhood on Friday night, lasting well into the morning. Finally, a seventy-five thousand strong demonstration occurred on Saturday, with smaller clashes continuing throughout the night. These were only the large-scale actions amid a wide variety of smaller protests and direct actions occurring simultaneously in different parts of the city, diverting police attention and spreading out their resources. The police forces dedicated to suppressing the actions, already making up over 8% of all cops in Germany, had to call in reinforcements. Contrary to the picture depicted in much of the media, the autonomous zone was not one of total destruction but much more closely resembled a massive party. The vast majority of the restaurants and bars remained open and thousands of people continued their Friday night out, free from incursion of the police, defended by both barricades and black bloc on the peripheries. The destruction that did occur was aimed at large businesses, banks, and the light poles, garbage cans, and other debris used for the barricades. Some people certainly took advantage to acquire some goods that would usually be too expensive for them to afford, but for the vast majority the “riots” weren’t about looting: they were an attack on capital. Defeating the police, kicking them out of a neighborhood, and disrupting the proceedings of a conference of world leaders, even temporarily, is a beautiful slap in the face to the state. That said, this victory did not come out of nowhere: it is important to recognize the less flashy work that made it possible. A wide variety of groups were involved in organizing the actions and the support networks that made them possible. The operational backbone was a network of squats, social centers, and radical spaces organized autonomously but loosely coordinated with meetings between them. They acted as info points, offering maps and information as well as offering food (generally on a pay-what-you-can or free basis), bathrooms, shelter, and some places to sleep. Mobile kitchens from a variety of places (including from la ZAD) also provided food. When the camps were shut down by the police, despite a court order to the contrary, churches around the city as well as a many individuals offered their spaces for people to stay. Before the actions there were action trainings, teaching people how to break through police lines, set up human blockades, information about repression, and tips on organizing affinity groups for the demonstrations and actions. Legal aid through Rote Hilfe as well as medical aid were also organized: the latter proved indispensable given the police’s focus on creating injuries. Part of what made the resistance to G20 so strong was that it was organized by many different groups utilizing a variety of tactics, including mass demonstrations, alternative conferences (an explicitly anarchist one before the summit itself, and a less radical but larger one overlapping with the first day), small direct actions and blockades. This diversity of tactics made the resistance less predictable and therefore harder to control, as well as making it possible for people comfortable with different levels of confrontation and action to contribute. Another source of strength was the people of Hamburg, many of whom stepped forward to offer solidarity. In addition to those who directly participated in the actions, of whom there were many, others offered water and other necessities from their homes, and their continued presence around sites of resistance allowed for those on the front lines to retreat, change out of their black clothes, and merge with them. This level of solidarity, even by those who are not willing or able to act themselves is indicative of the work put in by years of local struggle and a testament to the necessity of normalizing resistance. The demonstrations and actions were markedly international (and anti-national for that matter, anarchists were almost certainly the predominant tendency in the direct actions although only a plurality in the largest demonstrations), with radicals present and active from across Europe and elsewhere including a massive Kurdish contingent. This was made possible because of the organizing of free food and shelter for protesters, as well as the networks between radical groups across Europe. The international presence served as a resource during the struggles as participants’ differing backgrounds and origins provided diverse experiences and knowledge to draw from, expanding the range of tactics used and providing an opportunity to share that knowledge at the barricades. The resistance itself was beautiful. But while there was a high degree of spontaneity, especially in regards to the specific actions on the ground, this would not have been possible to anywhere near the same degree without the tireless organization of the mutual aid and solidarity networks that supported it. This kind of patient, behind-the-scenes organizing will be crucial if we want win similar and greater successes against the forces of the state and capital in the future. The organizers of the mass demonstration on saturday are claiming that 75,000 took part in that demonstration. The figure of 200,000 given in the article above is heavily exaggerated. The destruction was not only aimed at large businesses. There isn't hardly any large business in the Schanzenviertel. The largest scale business affected was a franchise drugstore and a smaller scale REWE supermarket. In addition quite a couple of windows at small-scale shops were smashed. When it comes to the cars cooked at the Elbchaussee on thursday, some of them were in fact BMW, Mercedes and other expensive cars. But there were pretty much the same amount in small cars burnt down just because there was no bigger one available as an adequate trophy. The aftermaths of the Hamburg spectacle are by far not as shiny as the author(s) want to make us believe. The witch hunt is on, the cops established a 170 or so special panel including cops from several european countries in order to cross-border hunt down the "terrorists" with the thousand of fotos and video clips they collected with their cop squealer website. We will see what will happen. The by far larger problem might be the decomposition process initiated by the Hamburg fiesta. Smashing the own hood instead of the rich and beauty one seems to be somewhat difficult to convey even amongst what is remaining of the radical left.